The Israel Museum, established in Jerusalem in 1965 as an encyclopaedic museum of art and archaeology, has grown over the past half century to become one of the world’s foremost cultural institutions. It has built a far-ranging, interdisciplinary collection of nearly 500,000 objects, ranging from ancient artefacts to contemporary art, through a legacy of gifts and support from its international circle of Patrons and Friends Associations. From its inception, the Israel Museum was conceived as a dynamic and modular museum, designed to encourage the growth and diversification of its holdings over time. In November, Christie’s in New York presents a landmark opportunity to acquire works from the storied institution in its Impressionist and Modern Art sales during 20th Century Week. At the core of the offerings from the museum are a selection of works from four private collections: the Charlotte Bergman Collection, the Vera and Arturo Schwarz Collection of Dada and Surrealist Art, Selections from the Carl H. and Ruth L. Gans Collection, and the Arthur and Madeleine Chalette Lejwa Collection. These collections each offer a window onto a shared commitment to the establishment and success of the Israel Museum, as well as some of the collectors’ deep ties to the state of Israel. The groundwork for the Carl H. and Ruth L. Gans collection was laid in the Netherlands in the 1950s and ’60s, when Ruth’s mother, Elli Landsberger, attended local auctions to bid on works by Piet Mondrian. Ruth’s father, Leopold, was also one of the leading Dutch collectors. Carl and Ruth, both natives of Germany who moved to the United States before the war, inherited their collection in 1980 from Ruth’s parents. The works from the Israel Museum selection, all by Mondrian, were painted in the two decades when the artist still lived around Amsterdam, where he’d gone in 1892 to study at the Academy of Fine Arts. Dutch artists of the era responded to the rapid growth and industrialisation of the city by turning to the countryside, creating idealised plein air landscapes in the Barbizon style for a nostalgic audience. In Landzicht borderij mit witte lucht (Landzicht Farm with White Sky), above, Mondrian has transformed a stand of trees on the edge of the busy port city of Rotterdam into a vivid study of negative space, with the strong verticals of the bending tree trunks creating a lattice work against the pale sky. In the painting, Mondrian employs a carefully controlled geometry that prefigures the busy grids and white grounds of his later works. Charlotte Bergman was born in Antwerp, the daughter of a prosperous diamond merchant from Poland, and suffered many losses in her family during the Second World War. In the aftermath of the Six-Day War in 1967, she converted her longtime support for the state of Israel into citizenship, directing her extensive resources, in financial support and through donations from her Modern art collection, to advance the vision of Teddy Kollek, her friend and the mayor of Jerusalem, for a national museum. As part of her bequest, Charlotte Bergman gave her home, and her art, to the museum, on the condition that it would continue to serve as a centre for gatherings, lectures, concerts and community activities. Over their many years of collecting, Bergman and her husband made personal visits to many of the artists they collected in depth, and the list of their friendships reads like a who’s who of modern art: Picasso, Braque, Aristide Maillol, Georges Rouault, Alexander Calder, Marc Chagall, Henry Moore and Raoul Dufy. The selections from the Israel Museum affirm the range of these intimate connections. 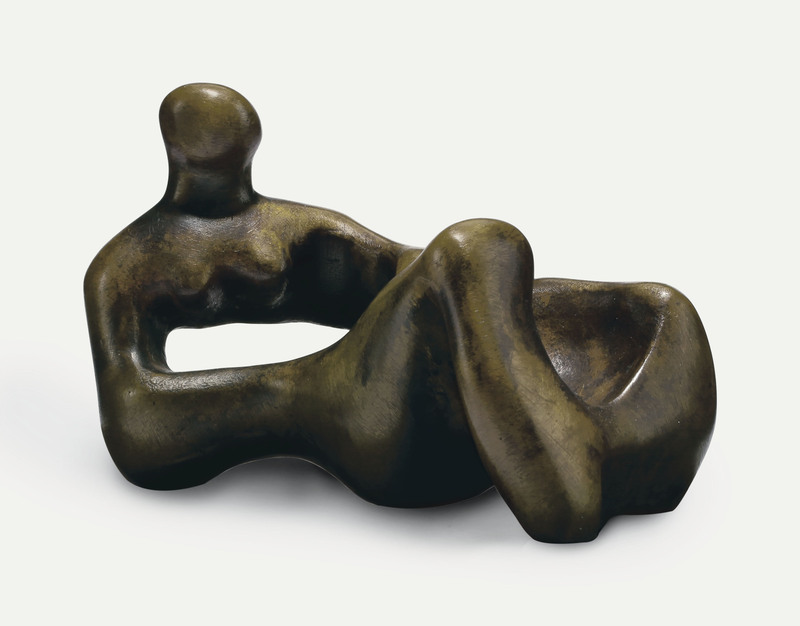 Henry Moore’s semi-abstract organic forms in bronze seem as indebted to the craggy caves and coastal bluffs of the artist’s native Yorkshire as they are inspired by the female form. Recumbent Figure (above) represents the first time the sculptor made a maquette for a large stone carving. The work that it inspired became a masterpiece, now in the Tate, London, and is the first in his oeuvre to make use of the large, central negative space — a hole, as Moore called it — that is as much a presence in his work as the form itself. Milanese art dealer, art historian, lecturer, poet, collector, and curator Arturo Schwarz was born in Alexandria, Egypt, in 1924 — the year the Surrealist Manifesto was published. In Alexandria he made the acquaintance of the Egyptian Surrealists, and began corresponding with André Breton. Between 1945 and 1948, Schwarz established the publishing house Culture and Progress and an affiliated bookshop, Culture, in Alexandria, and also began assembling his library of Dada and Surrealist publications. Schwarz settled in Milan in 1947, and founded another avant-garde publishing house, the Libreria Schwarz, which primarily sold essays on art and philosophy, and some fiction. Libreria Schwarz evolved from a bookstore into a gallery, the Galleria Schwarz, in 1959, with Schwarz holding exhibitions of many prominent Dada and Surrealist artists, as well as Italian and international contemporary artists at the beginning of their artistic careers. In the 1950s and ’60s, Marcel Duchamp and Man Ray forged close relationships with Arturo Schwarz. He produced editioned replicas of 14 Duchamp readymades in 1964-65, and editioned replicas of 10 Man Ray objects in 1963, 1964 and 1971, in close collaboration with the artists. These projects joined together two central motivating factors for replication: the reconstruction of lost work and the desire to disseminate it to a wider public. In 1998, Schwarz donated his collection of Dada and Surrealist works to the Israel Museum, a gift of nearly 800 works by more than 200 artists that instantly made the museum a primary destination for the study of the two key 20th-century movements. In 1954, Arthur and Madeleine Chalette Lejwa launched Galerie Chalette, or La Chalette as it was known in art circles. As gallerists, they were particularly supportive of the Constructivists and Suprematists, championing artists like Kazimir Malevich and Wassily Kandinsky, as well as presenting up-and-coming artists such as the Polish painter and optical illusionist Wojciech Fangor, and introducing rising stars in Europe to an American audience. Madeleine was born in Paris and then moved to Poland as a child; Arthur was a Polish native who later learned of the losses in his own family in the concentration camps while representing the Polish government in exile at the United Nations. The couple met in New York, and married in 1947. In 1967, after the Six-Day War, Madeleine and Arthur’s concern for the Jewish people and deep connections in the art world were mobilised to help their friend, Mayor Teddy Kollek, who was the driving force behind the establishment of the Israel Museum. From the outset, the couple added to their financial support of the building effort by donating art work for the museum. 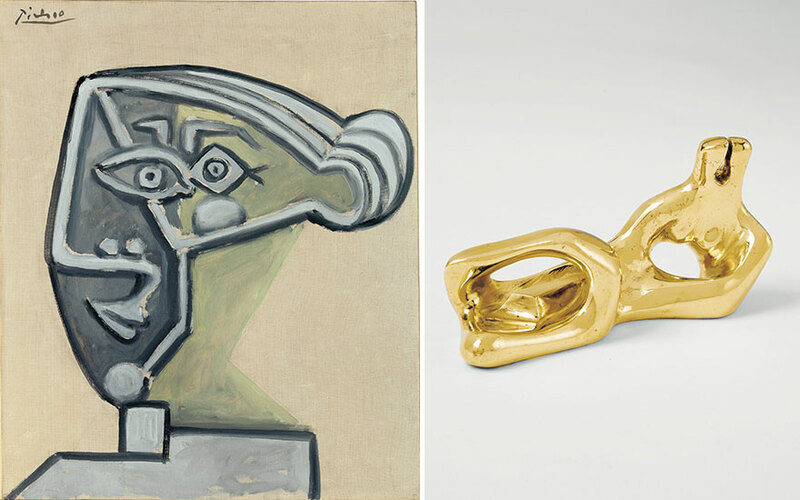 The couple enjoyed close friendships with Jean Arp and Pablo Picasso, who drew a serene sketch of Madeleine that remains in the collection of the Israel Museum. Among the many highlights offered at Christie’s this season is Picasso’s Tête de femme (above), a searing portrayal of his muse Françoise Gilot in the final years of their tumultuous relationship. Another standout from the Lejwa Collection is Jean Arp’s Déméter, a dedication to the Greek goddess of fertility, and his new wife and longtime collaborator, Marguerite. All proceeds from the sale of these works will be directed back into the Acquisitions Fund for the Department of Modern Art at the Israel Museum. The department’s goal is to make strategic additions over time that will strengthen and enhance the diversity and scope of the its collection.